The name "Rextravaganza" originated when former SLC member, Devapratim Sarma, creatively suggested that the first talk in the fledgling series by Erik Rombokas be titled "Rombokas Rextravaganza with Lunchtime Repast." This was a way to functionally combine "Research Extravaganza" into a single word, mention Rombokas’ name and add a little flair for extra credit. The SLC liked Sarma's idea, adopted the name, and later down the road, a condensed version stuck. So there you have it — "Rextravaganza." Everything has a history. Although the name for this forum might be a bit tongue-in-cheek, the purpose, goals and content are quite earnest. The structure of the meeting includes research presentations by CSNE-affiliated students, each followed by questions from the audience. Talks are in-depth explorations of neural engineering and the student's related research findings. Recent topics presented include, "Cortical Dynamics and the Subspace of Relevance" (James Wu), "Intact Neural Feedback Systems" (David Bjänes), and "Developing Methods for Side Effect Management in Closed-Loop Deep Brain Stimulation" (Maggie Thompson). 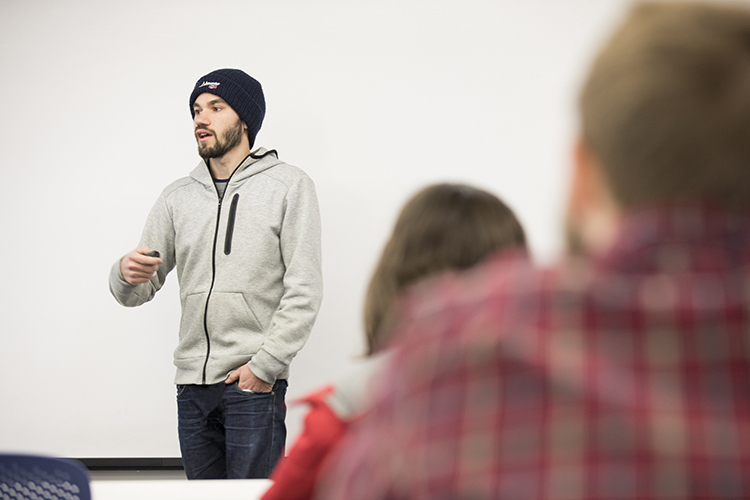 Given the number of CSNE-affiliated students at the UW and variety of research fields the students participate in, Rextravaganzas cover a wide range of topics related to neural engineering throughout the year. Undergraduate, graduate students and post-doctoral fellows who receive CSNE SLC Travel Awards for a conference are required to give a Rextravaganza presentation about their research or a summary of the conference they attended. Students who are interested in doing practice talks for examinations (qualifying, general and defense) also present at a Rextravaganza, and any CSNE- can request a presentation time from the SLC. Rextravaganzas are open to any students interested in neural engineering. "In my opinion, the best things about this event series are that it brings together a group of students from differing research labs and departments that may not otherwise have much interaction, and it creates a sense of community and support," said David Caldwell, M.D./Ph.D. student in Bioengineering at the UW and CSNE SLC officer. "It additionally offers feedback and support on research to the presenter, which is invaluable in gaining confidence and improving presentations for conferences and exams." 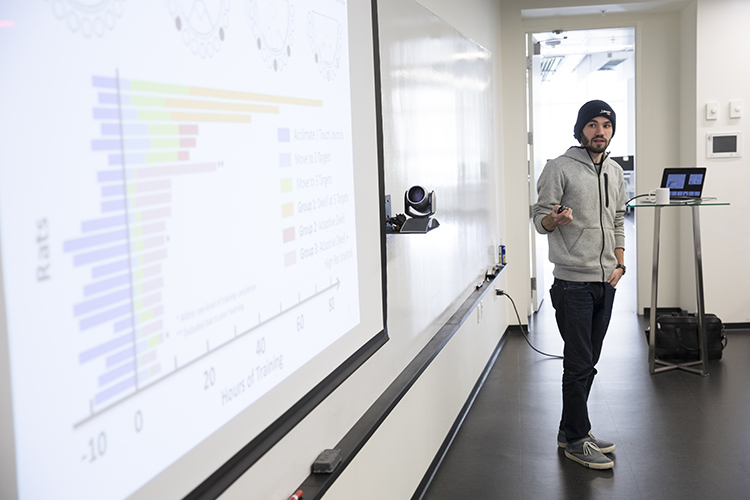 Presenting one's scientific research to an audience can be daunting, so the SLC tries to keep the presentations student-to-students. This way, people can feel more comfortable presenting preliminary research and practice talks. The conversational atmosphere also helps those in the audience feel comfortable asking in-depth questions. This openness allows students in the audience with related issues in their own research to safely investigate scientific problems from a new perspective, and receive direct, constructive feedback. "Another great thing about the event series is that students with similar interests and skillsets, in terms of methods, algorithms and hardware, can meet and brainstorm to further collaborative research and address roadblocks that may be impeding progress," said Caldwell. "I hope that students that come to these events leave with the knowledge that there is a community of like-minded peers interested in neural engineering and with fresh insights from the research presented." Inquiries about Rextravaganzas are welcome. For more information, please contact CSNE SLC officer, David Caldwell.